It was Sunday, October 30, 2011, the day most of my friends and family will say my life took a crazy turn. They say I became a groupie. I spent that weekend helping my brother-in-law who was promoting the Red Stick Bike Rally. For weeks I had heard about a great band from Nashville that he booked for the closing act. He said they were known for their talent and ability to pull the crowd to the stage. He was right! “The Devil Went Down to Georgia” by the Charlie Daniels Band has always been one those songs that makes me reach over and turn up the volume. Wow! The version I heard that Sunday was spectacular. I’d just seen the best fiddle player and lead guitarist I’d ever seen and it wasn’t The Charlie Daniel’s Band. It was Sarah Wilfong and Jake Taylor of the Mustang Sally Band. We all know the devil was looking for a soul to steal in that song, but this band just won mine. 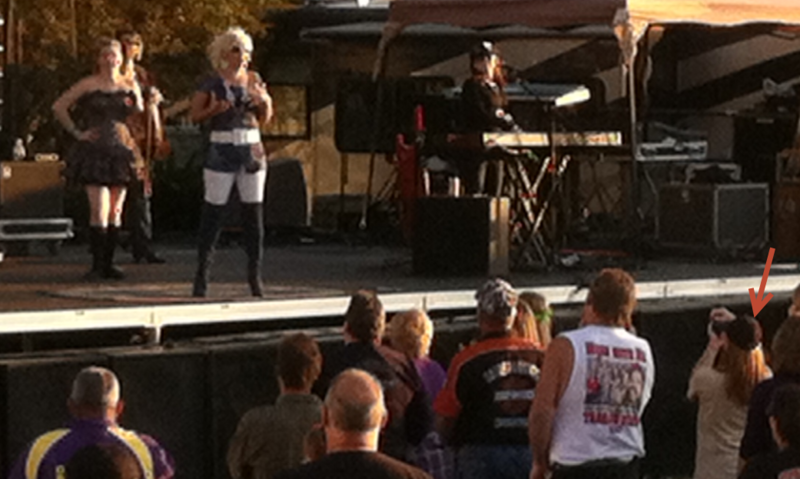 The crazy blonde lead singer with her awesome voice had already caught my attention. This band just seemed to pull me in the more I watched. From the beginning I saw talent and the music was great, but they had something else – PIZAZZ! The crazy blonde (Tobi Lee) was spontaneously joking with and calling out the crowd with the abetting of the keyboard player (Rachel Soloman) and rhythm guitarist (Brenda Zitzman). I could barely see the drummer (Lisa Romeo), but she kept a steady beat while the crazy trio stopped singing to cut up. I wonder how many calories she burns during a set? Last, but not least, the bass player (Mandy Holbert) kept the band in rhythm with her distinctive and commanding posture. Shortly after the rally I found the Mustang Sally Band’s web page and Facebook Page. I saw a mention on the Facebook Page thanking the fans who saw the show at the Red Stick Rally. I commented on that post and to my surprise, Tobi Lee thanked me back. At the risk of being accused of stalking, I began following the band members on Twitter. To my surprise, I was not only welcomed by them, but I found a great group of fan club members. I was really blown away last January when my wife and I traveled to Vicksburg, Ms to see a show. One of the fans contacted us to let us know she would be saving us a table near the stage. That fan, who I will only refer to as the gal in the black hat, has become a great friend of ours. As a further surprise and just to show you how much this band appreciates their fans, the members knew me when I met them after the show. (This band makes a special effort to make themselves available for autographs and small talk after every show.) I still think they think I might be a stalker. Since last October, I have seen the Mustang Sally Band 6 times. This weekend we will see two more shows at the Isle Casino in Biloxi. If you are looking for something to do, come join us for lots of fun and good music. To say the least, they are very entertaining and crowd pleasing. Tobi Lee has been quoted (accurately) as “about as calm as a twister in a trailer park”. Tobi’s voice along with the band’s music is as good as it gets, they will sweep you away. If you can’t make the show, check them out on YouTube, MustangSallyBand.com or go to Itunes and buy their album. Here is a great example of the band involving the crowd. As you can see Tobi Lee loves to include kids and even assists fans in making videos. Below: Tobi Lee working the crowd at the Red Stick Rally. I unknowingly caught my (not yet met) friend and MSB big time fan in the black cap. My Vegetable Garden is Starting to Get Happy! This year I planted the vegetable garden two weeks before Easter. Three weeks ago I side dressed the plants with ammonium nitrate and it is starting to get happy. Yep, that is the same stuff Timothy McVeigh used to blowup a building. It is pure nitrogen with a number rating of 34-0-0. It really gives the plants a boost, as they go into fruit production. It also put the weeds into a growth spurt. Last week I left town without having time to weed the garden. I fully expected to come home to a jungle. To my great fortune, my wife spent one of her off days weeding the garden. It looked fantastic when I got home. I am growing cucumbers, tomatoes, zucchini, bush beans, bell peppers, watermelon, and cantaloupe this year. For the second year in a row, the zucchini has performed dismal. This is unfortunate since my wife and I love to eat it. I doubt I will plant them next year. This was my first year to plant bush beans, watermelons and cantaloupe. The beans have produced several meals already. Right now the watermelons and cantaloupe have lots of blooms and are starting to spread everywhere. Thankfully, I gave them plenty of room. The last two years have produced rather small bell peppers. This year I consulted with a local vegetable garden expert about getting more size to my bell peppers. After some discussion of possible reasons, he suggested I try adding more fertilizer when I first plant the peppers. That did the trick. I am now picking grocery store quality bell peppers. My wife loves to eat cucumber and tomato salad. Last year the garden produced a lot of cucumbers and tomatoes. The problem was by the time the tomatoes were ripe enough to pick, the cukes had played out and withered away. This year I adjusted my planting time by planting the cukes a few weeks later than the tomatoes. I am happy to report both are producing at the same time this year. 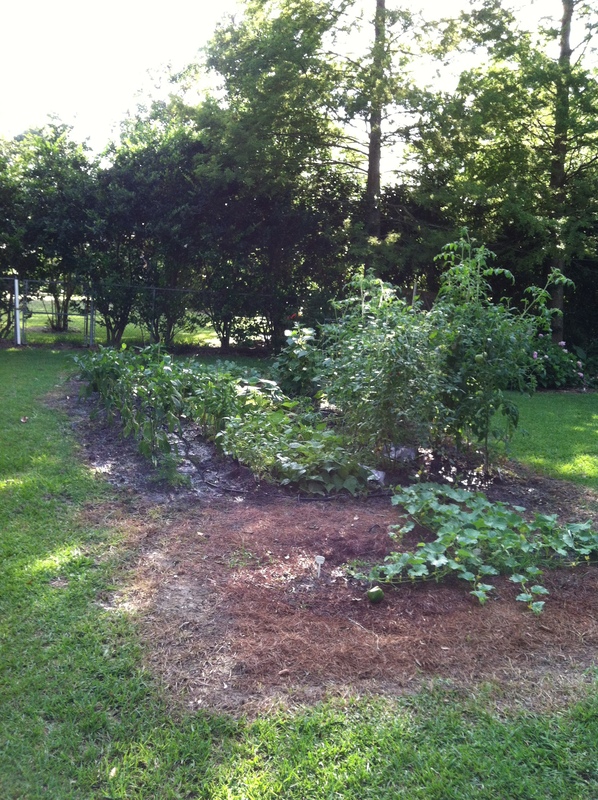 Below is a picture taken this week of our happy vegetable garden. Last week we had our annual work crawfish boil. Don’t freakout! It was after work and no tax dollars were spent, as far as I know. At least I hope not, I shelled out $40 for two tickets. When it was over, there were plenty of leftover crawfish, corn and potatoes. Some of us began filling “doggy bags” and talking about what we were going to do with the leftovers. I thought it would be fun to share some ideas. The simplest thing to do would be to eat the leftovers, as is, the next day for lunch, either cold or reheated. It would be good, but a boring repeat. The leftovers have soaked up some wonderful spices and can really make some more delicious meals. Cooks add a lot of different food items into their crawfish boils in addition to crawfish, potatoes, and corn, such as mushrooms, garlic, sausage and hotdogs. What’s the most unique food item you have seen? Just what is this stuff you call Jambalaya? This pot will easily feed 10 people. Jambalaya is a popular dish in Louisiana, probably because it is fairly inexpensive to make, can feed a lot of people, and cooked with just about anything you have on hand (perfect for that left over roast, or turkey you have become tired of slicing and warming up). In spite of being cheap and made with old food, it’s very tasty. It’s fairly simple to make and you only dirty one pot for a meal. This makes this dish perfect for a family or social gathering. There are three parts to a jambalaya – meat, vegetables, and rice. The dish is culminated when you add water and heat to bind the ingredients together. Think of making a stew with lots of gravy, then adding raw rice to soak up all the gravy. 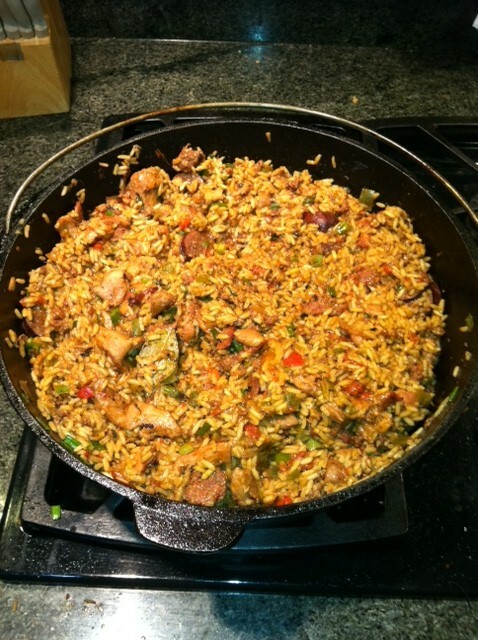 Jambalaya’s key ingredient is a lone meat or any combination of beef, pork, chicken, sausage, giblets, game or seafood. There were originally two types of jambalaya, Creole and Cajun. Now days, you may find hybrids of both as cooks share their recipes. Creole jambalaya, sometimes called “red jambalaya,” is mainly found in New Orleans. It gets its red color from adding tomatoes as an ingredient. 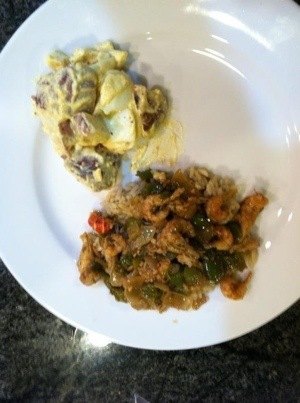 Creole jambalaya also tends to have more complex seasonings and seafood as an ingredient. Cajun jambalaya, or “brown jambalaya,” is more likely found in the rural and Cajun parts of Louisiana. It gets its brown color because meat is seared in the first stage of cooking, thus carmalizing the bottom of the pot. By adding water or broth, the carmalization breaks away, adds a brown color, as well as flavor, and turns the rice an appealing brown color. Cajun jambalaya tends to have a smokey flavor from smoked meat or sausage being used. The seasoning is likely a simple combination of salt and peppers. A third, less popular type, is sometimes called Poor Man’s. It usually consists of ground beef, cabbage and rice. Next I’ll post one of my jambalaya recipes. 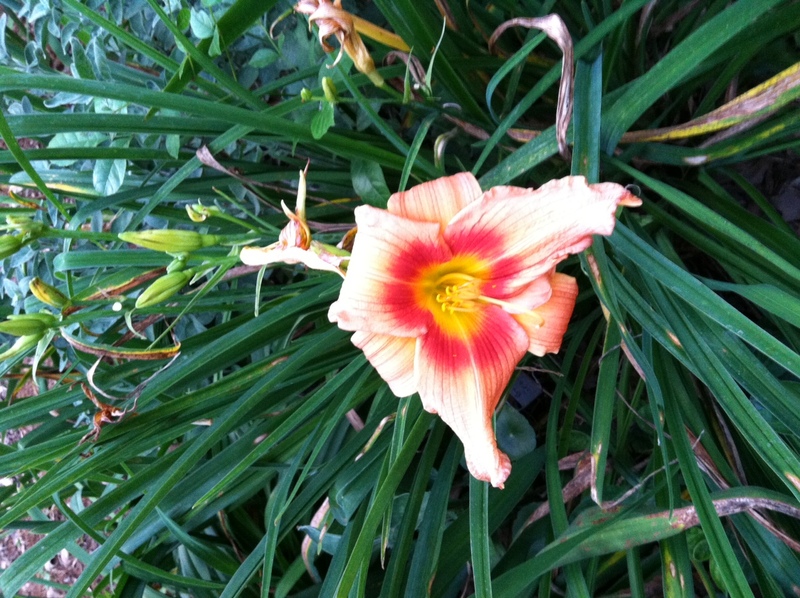 Welcome to the début of my kitchen and garden blog, a place where I can ramble about my two favorite hobbies. I suppose these are the right hobbies because for the last 30 years I have worked in a profession that deals with so much ugliness and distaste. It is my hope to share some of my experiences with you. Many of my Facebook Friends and Twitter Followers have seen my “What’s for dinner you wonder” or “Today’s gift from our backyard” and asked for recipes or gardening advice. 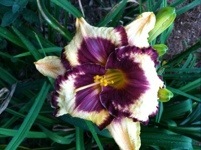 I will use this blog to pass on recipes, gardening tips or just ramble about whatever. Living in South Louisiana, I naturally favor Creole and Cajun recipes, but also like to cook Italian dishes, as well as, just about any type of barbecue. I have not always been a Cajun. I was raised in the Redneck part of the state (North Louisiana). I married a Cajun girl who taught me the basics of South Louisiana cooking and I took it from there. 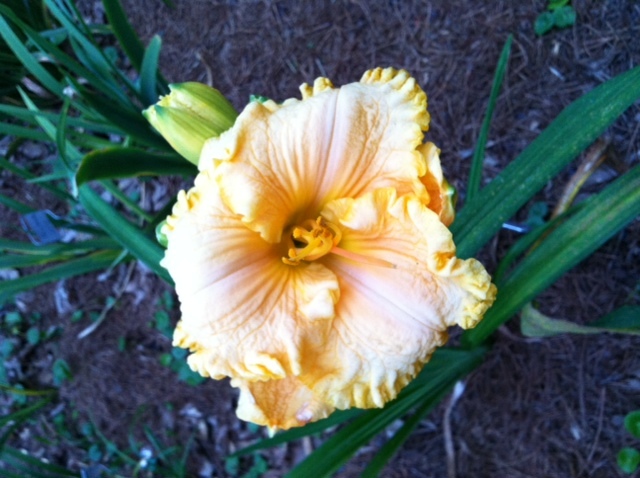 All of my gardening posts will be specific to South Louisiana. 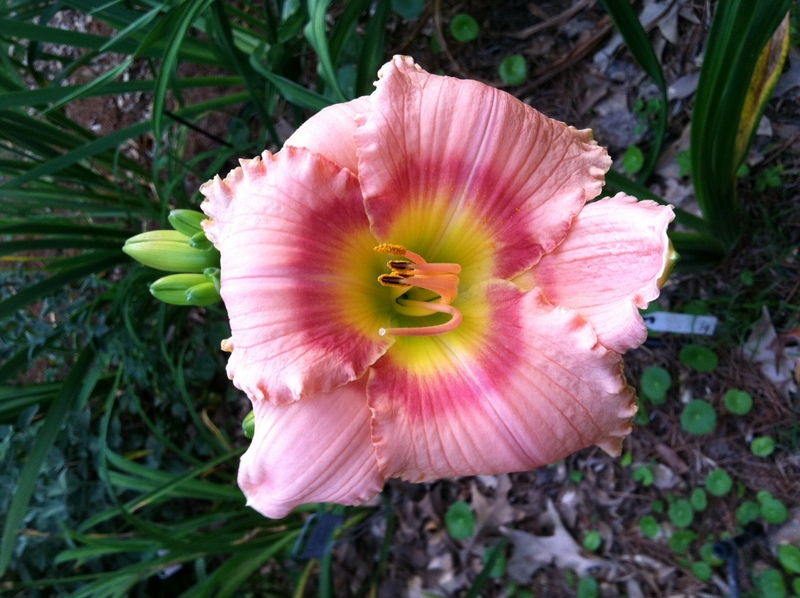 My gardening knowledge comes from personal experience and serving, many years ago, as a volunteer Certified Master Gardener.